Montserrat Weather: Sun, Storms, and... Snow? The Montserrat weather makes this one of the most outstanding Caribbean islands. Check today's forecast for below, and get information about the conditions all year around in the Weather Montserrat sections below. Montserrat (often referred to as the "Emerald Isle of the Caribbean") can be found in the Leeward Islands, in the northern end of the Lesser Antilles archipelago. Owing to its Caribbean location, visitors can expect Montserrat weather that is warm, tropical weather for most of the year. However, this is not to say that weather in Montserrat is typical. Temperatures don't vary much from the summer to winter seasons  this Caribbean island maintains a warm 76 to 88°F (24 to 32°C) temperature pretty much all year. Gentle breezes from the tropical trade winds blow almost constantly from the sea or from the mountains, providing some comfort from the tropical heat. Since Montserrat is located on the leeward side of the Lesser Antilles, it is shielded from stronger winds that beset its neighbors to the east. Also, Owing to Montserrat's proximity to the equator, the length of a day varies little from summer to winter. Though there is a rainy season from July to November, the remainder of the year does see some rain. 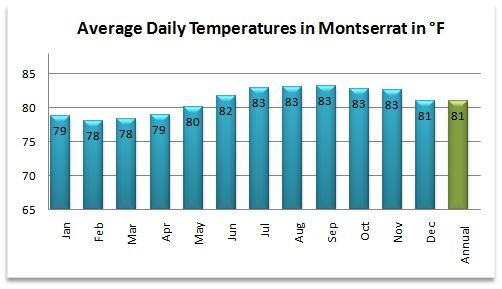 The average total rainfall for Montserrat for the year is between 50 and 80 inches (125 to 200 centimeters). Rain is rarer in the dry season, which the locals call "Creole Lent," from December to April. You should expect around twenty sunny days every month on this Caribbean island. The island of Montserrat is in the path of tropical hurricanes. Violent hurricanes occur only every few years, usually in the heart of the rainy season. September is the peak season for hurricanes and the number of hurricanes can range from two to ten in a year. Who says it doesn't snow in the Caribbean islands. Not Montserratians! A unique geologic feature of this Caribbean island is that it has an active volcano, The Soufriere Hills Volcano. Regularly, the volcano covers the island with a dusting of ash, referred to by Monterratians as "gray snow". While the volcano considered "active", tourists shouldn't worry that they'll find lava flowing outside their hotel room: the cities and villages of Montserrat are built well away from the volcano.